The online periodical El Faro provides great news coverage and analysis of El Salvador and just gave its website a facelift this week. 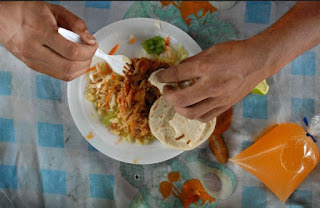 This week's features included a photogallery illustrating what Salvadorans eat for lunch. Check it out. With Christ, God has injected himself into history. With the birth of Christ, God’s reign is now inaugurated in human time. On this night, as every year for twenty centuries, we recall that God’s reign is now in this world and that Christ has inaugurated the fullness of time. His birth attests that God is now marching with us in history, that we do not go alone. Humans long for peace, for justice, for a reign of divine law, for something holy, for what is far from earth’s realities. We can have such a hope, not because we ourselves are able to construct the realm of happiness that God’s holy words proclaim, but because the builder of a reign of justice, of love, and of peace is already in the midst of us. Christmas Day, 1977My best wishes for a Merry Christmas and Prosperous New Year for all the readers and friends of Tim's El Salvador Blog. 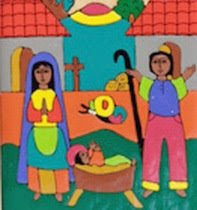 May peace and justice flourish in 2009 in El Salvador and throughout the world! SAN SALVADOR, El Salvador -- President Tony Saca announced Tuesday he will withdraw Salvadoran troops from Iraq after Dec. 31, pulling out the only remaining soldiers from Latin America. Five of El Salvador's soldiers have been killed and more than 20 have been wounded since the country deployed troops there in 2003. It currently has 200 soldiers based near the southeastern Shiite city of Kut. In the five years that Salvadoran soldiers have been in Iraq, they have completed 350 health, education and infrastructure projects that benefited an estimated 7 million Iraqis. The Center for Disease Control in the US has issued a report concerning incidents of the disease histoplasmosis among church groups which had traveled to El Salvador on mission trips. Half of 33 travelers on recent church trips from Pennsylvania and Virginia studied by the CDC came down with the disease, and six required hospitalization. Histoplasmosis is a fungal disease found throughout the world and acquired from inhaling dust containing histoplasma capsulatum spores. The infection can cause a mild flulike illness and can result in loss of lung capacity. A new poll from the Public Opinion Institute at the University of Central America in San Salvador (IUDOP) has been released. The poll shows the FMLN with a signficant lead in all categories for the upcoming 2009 elections, including a 16 point lead in the race for president. 50% of those polled have little or no confidence in the upcoming elections. 62% believe the economic condition of the country worsened in the past year. 80% believe the cost of living increased a lot during 2008. 62% agree with the statement - "if ARENA wins the next elections, the rich will be richer and the poor will be poorer." There is a new issue leading the ARENA government and its allies in the big media outlets to suggest the population should fear the FMLN. Government officials have recently asserted that 40 "armed groups" are organized throughout the country, particularly in areas which had been controlled by the FMLN guerrillas during the civil war. 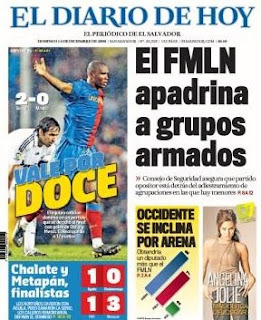 The controversy erupted with the December 14 edition of the right-wing newspaper El Diario de Hoy which ran a cover story with the headline "FMLN sponsors armed groups"
Inside and out, the rusted towers of El Salvador’s biggest grain silo show how the World Bank helped push developing countries into the global food crisis. Inside, the silo, which once held thousands of tons of beans and cereals, is now empty. It was abandoned in 1991, after the bank told Salvadoran leaders to privatise grain storage, import staples such as corn and rice, and export crops including cocoa, coffee and palm oil. Outside, where Rosa Maria Chavez’s food stand is propped against a tower wall, price increases for basic grains this year whittled business down to 16 customers a day from 80. “It’s a monument to the mess we are in now,” says Chavez, 63. El Salvador to abandon dollar? For years, significant majorities of Salvadorans have believed that the switch from the Salvadoran colón to the US dollar as the country's national currency caused prices to rise and was otherwise bad for the economy. The FMLN opposed dollarization from the start, although Mauricio Funes has said that he would not return to the colón. Figuring out the net impact of dollarization is frankly not an easy task. Now it is possible that El Salvador may be on a path to abandon the dollar, but not to return to the colón. Last week presidents of Central American countries met and agreed to combat the current global financial crisis through regional integration including the adoption of a common currency and common passport. I want to point all the readers of this blog to an excellent article by Jacob Wheeler of In These Times titled El Salvador’s New Left. The article takes a look at the changes in the FMLN reflected in the presidential campaign of Mauricio Funes. The Frente now encompasses both an old guard for whom the rhetoric of death to capitalism comes easily and a presidential campaign with a platform of social democratic policies. As Wheeler writes, "El Salvador remains a country living in the past and present — divided by ideological lines, between left and right, and with many of the same faces from the civil war, shouting toward anyone who will listen. Whether Mauricio Funes will bridge that divide — or disappear into it — remains an open question." I attended a forum today on US immigration policy which included several personal narratives of the effect on families when US authorities seize a family member and deport him or her. US immigration laws are very mechanical -- compassion and appeals to a sense of fairness are not legal arguments to be allowed to remain in the country. It's a situation which many Salvadoran families with relatives working in the US have to face often. Despite the space given to covering ARENA and the FMLN in El Salvador's presidential election, there are two other candidates running for president under the banner of two of El Salvador's smaller political parties. Carlos Rivas Zamora is the candidate of the Christian Democratic Party (PDC). Zamora was the popular mayor of San Salvador from 2003-2006. Zamora quit the FMLN in 2005 in disputes with the hard-line leadership of the FMLN. He ran as a center-left coalition candidate for mayor in 2006 against Violeta Menjivar, and his candidacy almost cost the FMLN the election. Zamora follows the path of Hector Silva, another former mayor of San Salvador kicked out of the FMLN in a dispute with hard-liners, who ran as a center-left candidate for president in 2004, losing to Tony Saca.